Only the Brave is the heroic true story of the Granite Mountain Hotshots, a crew of wildland firefighters from Prescott, Arizona. Through hope, determination, sacrifice, and the drive to protect families, communities, and nature they became one of the most elite firefighting teams in the nation. They forged a unique brotherhood that came into focus with one fateful fire. On June 30, 2013, nineteen of the twenty members of the group perished while fighting the Yarnell Hill Fire. The movie is dedicated to their memory. As an Arizonan, this tragedy took place close to home for me. So I wondered how Only the Brave would do in theaters in our state. We already know what happened and we experienced the heartbreak firsthand, so why would we want to re-live the trauma? I do know a few people who are purposely avoiding the movie because it would be too upsetting to have to go through all that again. I must admit, the trailer was hard to watch, but I went to the movie anyway, tissues in hand. I saw it as a way of paying my respects to those brave men, to give them the recognition they deserved and remember them as the heroes they were. This movie guarantees that they will not be forgotten. 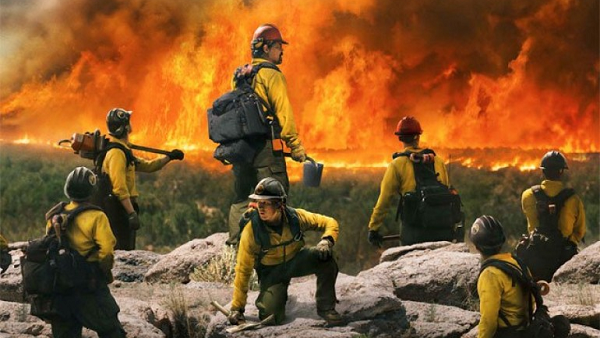 Only the Brave was released on Friday, October 20, just a week after the deadly Northern California wildfires. Even though this movie focuses on a particular group of Hotshots, it does a great job of educating the public about what all wildland firefighters do. I went to the 4:20pm showing on the first day. At that time there were already quite a few people in the audience, mostly older retired people. The movie runs for over 2 hours and I stayed until all the credits had finished, so I didn’t get out of the theater until 6:45pm. When I walked out, there was a long line of people already waiting to go in for the 7:20pm showing. So that told me a lot of people were like me and wanted to see it. Only the Brave was very well done, touching, and respectful to the guys. Most of it progressed like any other movie, learning about the characters with side plots providing a glimpse into their personal problems at home, seeing the rookies being interviewed for the position, and finding out how they came to become official Hotshots. It was a long process to get approved before they could call themselves that, and it was great how all they all came together and worked hard as a team to pass the inspection. The very first fire they went to was the Cave Creek Complex Fire, which I vividly remember because we could see it from our front window. The movie showed the helicopters sucking up water just like we saw, except this one was sucking it right out of someone’s backyard pool, which was a very impressive scene the way they filmed it. In the movie, the lead firefighter predicted that the fire was going to do a 180-degree turn and head straight for the town. But the incident commanders didn’t believe him, so a bunch of houses in the town of Cave Creek burned down, which didn’t really happen. During the course of the movie they also went to put out a fire at the Grand Canyon, saved the largest alligator juniper tree in the world from burning down near Prescott, drove to a fire in the Chiricahua mountains, and so on. For most of the time it was just an ordinary movie about firefighters doing extraordinary things, so much so that you get lulled into a false sense of security, because in movies the good guys always win, right? It wasn’t until the last half hour of the movie that they got to the Yarnell Hill Fire. You’ll know when the cinematographer zooms in on the town’s iconic sign which says “Where the Desert Breeze Meets the Mountain Air.” After that, the slow-paced movie speeds up and before you can even figure out what’s going on, in the confusion all of a sudden the guys are gone. I imagine that’s how fast it did happen in real life, with the storm coming in and the wind changing and next thing they know, the fire was on top of them. So that part was intense, for both the audience and the lone lookout hearing what was happening over his radio when he was helpless to stop it. In the followup scene, all of the families were gathered in the Prescott Middle School gym waiting for news. They had heard that one firefighter survived, but they didn’t know who. Of course they were all hoping that it would be their loved one. When the sole survivor finally walked into the building, still in his yellow and green uniform all covered with soot, I felt so bad for him when he saw the looks on their faces, because he wasn’t the one they wanted to see. So he turned around and ran back out. He wasn’t even married but many of the other men had wives, children and babies. Only the Brave had a really nice tribute at the end, showing photos of the real Hotshots with their names and ages. They were all so young and strong and happy. My mind flashed back to the funeral procession, as if I was standing on the side of the road watching the nineteen white hearses going by, except now I could see the men’s faces inside them. So sad! But they will live on forever in people’s memories thanks to this movie. While Only the Brave is a tragic story, the main takeaway is the sense of camaraderie and support that the Granite Mountain Hotshots had for each other, whether they were working on fires or back home just living their lives. It’s also quite interesting if you look at behind-the-scenes reports, how the Hotshots made such an impression on the actors, singer, crew members, and everyone who had anything to do with the movie. I have to give the actors credit, they took their roles seriously and really got into their characters. They did a great job of re-enacting the real people’s personalities, and they even looked amazingly like them! It was nice to see how everyone involved with the movie truly cared about the story and gave it their all. The surviving Hotshot was listed as the movie’s “creative consultant,” so I imagine it was a pretty accurate portrayal of his co-workers and everything, including the facts about his own personal life. The filmmakers even borrowed the actual Granite Mountain Hotshot buggies to make it as authentic as possible, which was a nice touch. The cinematography and special effects were spectacular, too. This is the best firefighting movie I’ve ever seen – I liked it even better than Backdraft, although they’re about completely different types of fires (and that one is an action thriller, whereas this one is a biographical action drama). But seriously, Only the Brave is definitely worthy of some kind of award. I just wonder what people across the country will think when they watch this movie, because anyone who doesn’t live around here might say what the heck, are they trying to make it look like a Western? The filmmakers definitely got the Prescott, Arizona, atmosphere done right. The people ride horses, wear cowboy hats and plaid shirts with bola ties, hang out in the rustic old saloon in historic downtown Prescott, drive pickup trucks on dusty dirt roads, etc. That’s exactly the way it is around here. I only wish it had been actually filmed in Arizona, but I was amazed at how the location looks so much like Prescott when it was filmed in New Mexico! The movie was originally going to be titled Granite Mountain, so I don’t know why they changed it to Only the Brave when there is already a WWII war movie by that name. They should have named it The Yarnell 19, because that’s what everyone called them. The movie mostly focused on three of the guys, though, but the other ones were all there, either in the background or with brief speaking parts. As a side note, they could have made this film from a Christian viewpoint. The only guy who actually mentions his religion in Only the Brave is a Buddhist, but near the end you see a guy who took his Bible with him into the fire. According to this article, Clayton Whitted was a former youth pastor at the Heights Church in Prescott. During shifts on the fire line, the crew would openly discuss Jesus or ask Clayton to tell stories from the Bible. It was through him that “Donut,” a wayward young man who joined the Hotshots to try and turn his life around, accepted Jesus as his savior, during a fire in New Mexico two weeks before Yarnell Hill. Hopefully this movie will make you appreciate the present moments you have with the loved ones in your life – and inspire you to start working out and climbing those hills! Rated PG-13, Only the Brave is a must watch on the big screen to immerse yourself in the fire scenes, and I’ll also be buying the DVD. Oh, and the music is awesome too! It sensitively captures every emotion, especially the swelling crescendo that slowly builds for over six minutes and then descends into a somber dirge at the climax of the movie. It so movingly captures the moment that the music itself should be nominated for best soundtrack. Click here for the original motion picture soundtrack (background music), and click here for additional music (country-western songs) from the movie. To learn more about how you can help support wildland fire communities through the Granite Mountain Fund, go to www.granitemountainfund.org.